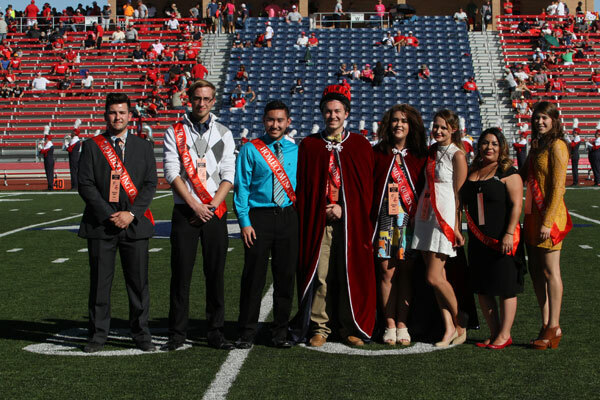 Two students were crowned Homecoming King and Queen during the 2016 Homecoming activities at Colorado State University-Pueblo, Oct. 12 to Oct. 16. 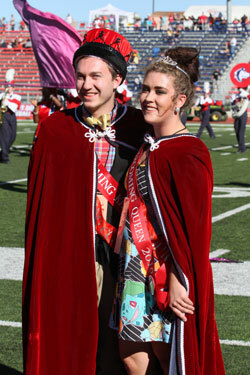 Timothy "Wayne" Pigott, Aurora, a graduate student (Master of Business Administration) in the Hasan School of Business, and Bailey Bair, Yuma, a senior Health Promotion and Wellness major, accepted crowns and capes during halftime of the ThunderWolves 33-12 victory over Fort Lewis in the Neta and Eddie DeRose ThunderBowl. The homecoming King and Queen are chosen based off of four factors; academics, interview, campus and community involvement, and student votes. Bair is president of the Health and Wellness Club, a student organization that educates students about personal health, Director of Student Affairs for Associated Students' Government, a member of the New Student Orientation CORE team, and is the special events chair for the Campus Activities Board. Pigott is a member of the Hasan School of Business Dean's Advisory Council, member of Lambda Chi Alpha Fraternity, vice president of Golden Key Honor Society, Graduate Student Advisor for Accounting Club, and vice president of Business Minded Individuals. All candidates were required to attend Homecoming activities, including the Howlin' House Party, pep rally, and bonfire on Friday as well as the student tailgate and game on Saturday. Tom and Vivian Hall, owners of Tom G. Hall Drywall, donated ceremonial robes to the CSU-Pueblo Athletic Department for use in the Homecoming coronation. Homecoming Royalty (left to right): Anthony Ball, Jeremy VanGelder, Jordan Moniz, Timothy "Wayne" Pigott, Bailey Bair, Anna Jordan, Fredlina Atencio, and Yamile "Jam" Ingles.